It's not there, and then it is. Click. So silky smooth and beautiful, this extraordinary new move is as versatile as it is visual. And it's all yours, available ONLY right here, at Vanising Inc. Magic. "Click" is simple in effect. A pack of cards wrapped with a rubber hand is show fairly. By simply snapping the band against the pack (Click) a selected card appears face up BENEATH THE RUBBER BAND. Watch the trailer...the move happens in less than instant, and it looks…well, perfect. 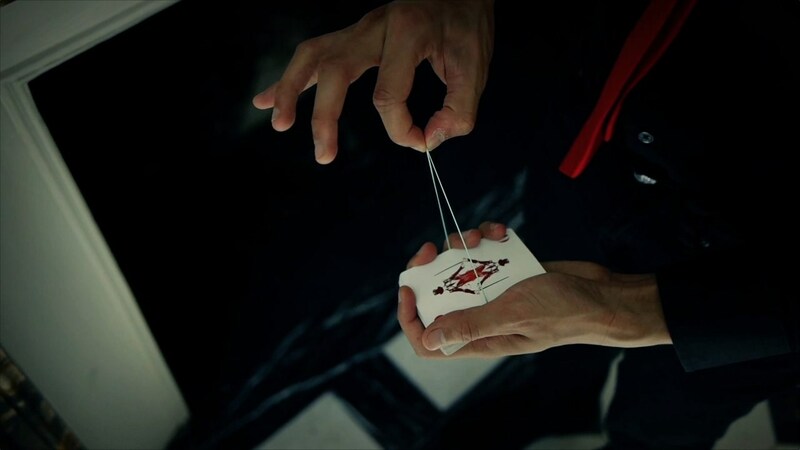 Taught by Patrick Kun and created by Valdemar Gestur, the move requires only basic card handling ability, though getting the movements down takes some knack. It took us an hour of fiddling before it started to look really good. But once you've got it, you've got it forever, and it makes the perfect finale to any pick-a-card routine or banded card routine. Running time: 12 minutes, 47 seconds. Click is so awesome. Valdemar always comes up with crazy ideas. The teaching is really good and easy to follow. It is kind of knacky but once you get it down, it is very simple. very visual effect. Love it! This is a great effect. It is a little knacky and will take some practice, but it is very visual. This will probably be best one-on-one, not surrounded. Quite an interesting thing you have here, and in my opinion, quite powerful. This is a great utility because it can be used in many different ways, and with many different routines. It can be used to reveal a selected card, you can use it as a color change, it can be done as a penetration effect of sorts, and it can even be used as a perfect finale for your ambitious card routine! As far as my own work with this is concerned, I use it occasionally as a color change, but most often I use it as a finale to my ambitious card routine. This is even more powerful than the WOW gimmicks (do not get me wrong - WOW/WOW 2.0 looks great, but it uses an extra object that you have to bring into, and take out of, play/use). The motivation is built-in and the work is quite easy, but as Patrick says in the video (and other reviewers above), it is a bit knacky. Once you get it though, you got it.